The 91st Oscar Academy Awards will take over screens big and small on February 24, 2019, live from the Dolby Theater in Los Angeles. 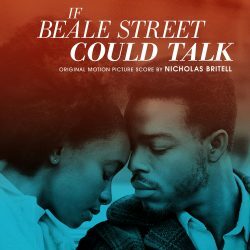 Nominations made headlines on January 22, and we wanted to give a nod to Nicholas Britell for his If Beale Street Could Talk Score (Lakeshore Records) Best Original Score nomination. If Beale Street Could Talk is a film adaptation of James Baldwin’s 1974 novel of the same title, directed by Moonlight’s Barry Jenkins. It follows two characters, Tish and Fonny (played by Kiki Layne and Stephan James), a young black couple with an undying love for one another. The film unpacks the many layers of their relationship when Fonny is arrested for a crime he didn’t commit. The score brings out every inch of emotion, heartbreak, joy, mourning, and injustice, completely and fully embodied within the film. Brass, French horns, strings, chopped up classical music, recurring musical moments, Britell in this interview with The Atlantic reveals how, with Jenkins, the “ final emotional musical landscape” came to be. It involved loving the music he was creating on a personal level while simultaneously loving it for the film, and fully aligning with the director’s vision. Congratulations to Nicholas Britell for his Best Original Score nomination! Additionally, Free Solo and The Wife received nominations for Best Documentary Feature and Best Actress (Glenn Close). Congratulations to Node Records and the artists who have contributed to the Free Solo Original Motion Picture Soundtrack and The Wife Original Motion Picture Soundtrack, delivered via The Orchard. To get caught up to speed on all the Oscar nominees, check out the full list here.